The Cooper Cobra tires are the best buy for the price in my opinion. Thought these tires would be quiet for mostly highway driving, but they have been extremely noisy since break in. Very difficult to balance...will not stay balanced. One has that out of round sound. Would not buy Cooper again. Absolute junk. Wasted a pile of money on tires that slip an slide and are not round. Balanced 3 times in different garages and still out of round. Contacted Cooper and they will do nothing to support me. Overall a good, reliable tire. Thought they were great, I want to put them on my Chevelle! Love my American made Cooper Tires. They are the best tires I have ever owned! They hold up in all weather conditions and do not break down from sitting still. Best tires for the money! Thank you! 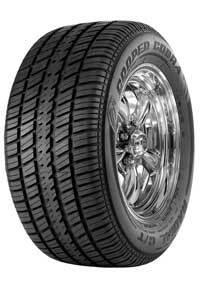 I have these on my 88 Chevy S-10 Blazer 4X4 , they look great and ride good. Got a lot of miles out of them. I put these tires on my 68 charger and then went on a road trip and no problems what so ever with the cobras. The road trip was 4000 miles cross country and and no problems with the tires. Perfect combination for my 1963 Ford Falcon Convertible. Exactly the sizes and widths I needed for a modified old ride. Get a lot of compliments. The Cobra has so much going for it. Not taking advantage would be a BIG mistake. I love my Cobras. They are stylish, yet extremely rugged. I have no worries in taking my 20-year-old, 220,000-mile Ford Ranger on the road, especially when it comes to my tires. Thanks for a great product, and I'll be buying more Cobras when the time comes. Have a blessed day. I bought these gt cobra 235/70/15 for my truck thinking they would be a good tire but I was wrong. I am not saying cooper tires are all bad but these were and to try to get cooper tires to fix the problem is like pulling teeth. So whoever is reading this might want to think twice about buying gt cobra tires. I was looking for a replacement for bias-ply tires that wandered around the road. I liked the look and ride on a couple of friends' cars. Was very happy with the result. They have great performance in wet and dry, and even a light snow ride to storage, an accomplishment in a 1970 Mustang. They seem to be stickier than the T/As, the only other model I'd consider. Always been a BF Goodrich TA guy. I looked at these and the reviews and people liked them better and they are cheaper. SO, I stuck a set on my 1970 Dodge Dart and LOVE them. Also look more aggressive than the TA's. Put a set on my '68 Chevelle. Looks great and rides well. Like the aggressive tread pattern. White letters stay white in my garage. Will only be driving in dry weather on roads. No rain/snow/offroad. Drive few miles per year so durability and treadwear not an issue. Been through many different tires on my Jaguar XJSs. This is the best ride on my 15in wire wheels. Smooth ride, low noise and corners well. Several winter seasons and no problems on snow or ice. Could there better? Maybe but these are perfect for a class ride so no reason to chase something that doesn't exist.